Happy Friday! This week seemed to fly by for me, which never seems to happen! My husband took some days off and has been working on the lake house renovations since Wednesday, so it has just Charlie (our Westie) and me for the past couple of days. Justin is coming home Sunday afternoon, and we are both looking forward to seeing him! Renovations are going well so far, but I am definitely anxious for it to be finished. I am starting to accumulate more and more decor, and I am ready to start decorating! Our boat is also getting delivered Memorial Day weekend - yippee! The house will not be finished yet (it will be close), but we will definitely be taking the boat out for a spin regardless. Basically, it is pretty impossible these days to not have the lake house on the brain. Of course, thinking about the lake house means summer is also on the brain. One of my staple items for summer is a straw tote. A straw tote is the perfect summer bag. J.Crew said it best in its description of the Farmer's Market Tote below: "Everything we want in a summer bag: Hand crocheted in resilient straw, it folds flat for easy packing and is roomy enough for toting all your essentials from the beach to the city streets." I couldn't agree more! I found the perfect straw tote last summer at Target, and it will be on repeat again this summer. You definitely do not have to break the bank to find the perfect straw tote. Check out some fantastic options at every price point below. Which is your favorite straw tote? Today I am featured on Coffee Beans and Bobby Pins and FACE IT Catalog for Amy and Amber's Friday's Five. I am very honored to be selected by these fabulous ladies! Be sure to check out the feature on their blogs today! I've been eyeing that kors bag for awhile now, so my biased opinion? The kors bag! I definitely need a straw tote. I think it would be great for summer! I love that RL one. So cute! 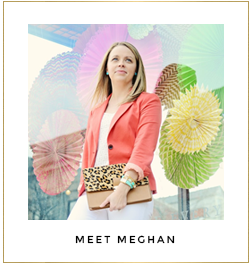 Great picks, Meghan. I love the Coach bag's hardware and bright yellow trim. That's my color crush this spring. I'd love to pick up a straw clutch this spring/summer too. The Ralph Lauren bag is my favorite! I love your blog, I am following you now! Feel free to follow back! My favorite bag is the Nordstrom or J.Crew pick! I also believe for every girl need fashion style so also they need more money or arrange good finance to create their fashion demand. overall I can say that need maximum amount of finance to get well fashion for girls.